Def Leppard have just premiered their new single Let's Go via Rolling Stone's website. Following on from last night's running order/song titles reveal by the band in Instagram. The first new music released by the band from their 2014-2015 self titled studio album sessions. Their first full studio album release since 2008's 'Songs From The Sparkle Lounge' and first new original music since the three studio songs on 'Mirrorball' in 2011. Listen to the full song now via Rolling Stone's website. You will notice Vivian quoted some of the opening lyrics ("Do This Now") as the title jokingly to a DJ a couple of weeks ago. Joe was interviewed and says Rick Savage wrote at least 80% of the song. Other new songs are described with the psychedelic (and acoustic) song revealed to be 'Battle Of My Own'. The full 14 track digital edition is available to pre order now priced 9.99 and the album will be released on 30th October. More details of the release were revealed by Planet Rock. On 30th October there will be a "CD Fanpack, double vinyl gatefold and digital editions." A "standard CD" will be released on November 27th. Which explains the Amazon listings. A new - Def Leppard Album Section - has been added to the Discography. Link to the Album News section to read the full story of this release (so far) as told by the band in their various interviews. 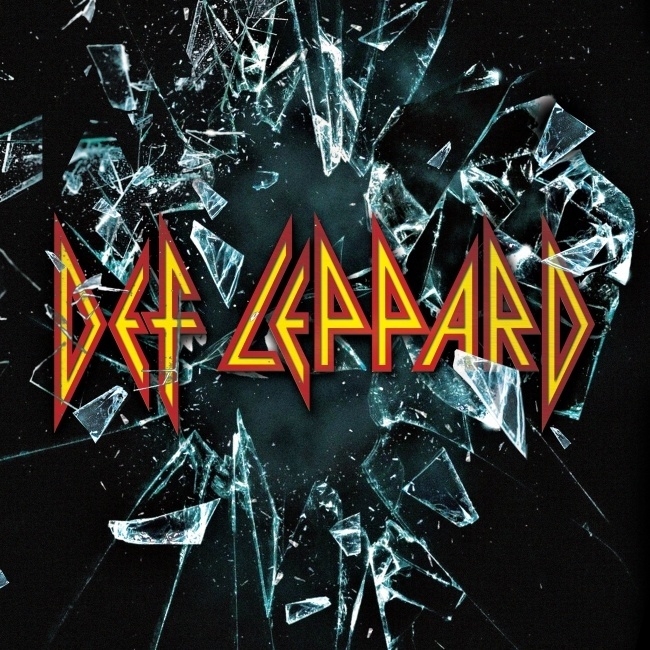 The cover art for the album was revealed as the same shattered glass/classic Lep logo seen on tour posters since February and advertised at all 2015 live shows since 15th April. This is the band's 10th all original studio album. And 11th overall if you count 'YEAH!' as a studio album. NOTE - The audio is now public and can be heard below. "Let's Go," the lead track on Def Leppard as well as the first single, is clearly about that love for playing. You sing, "Welcome to the party/Welcome to the edge of your seat." It's a call to arms, you know? Rick Savage wrote 80 percent of the song. I wrote the verses, he wrote all the music and the choruses. He came in with it, and we knew it was a classic Def Leppard song. It's that three-minute pop-rock stuff with big chunky guitars and a big chorus. And it has that swaggering, mid-tempo rhythm, like "Sugar," and "Rock of Ages." The idea was, we wanted something familiar. I mean, when AC/DC comes back after years away, you're not going to get "Bohemian Rhapsody" from 'em, you know? And you don't want it, either — you want "Back in Black," or something like it. For us, this is what we do. And it's something we enjoy doing. "Def Leppard tracks like "Let's Go" (the first single, premiering here), "All Time High" and "Broke 'n' Brokenhearted" exude the band's classic mix of Seventies pomp-glam riffing, Eighties electro-shock rhythms and patented, tremendously stacked chorus vocal harmonies in a manner that's strikingly redolent of their past. But the album also finds the band moving beyond well-trod territory, as evidenced by the slinky pop-funk strut of "Man Enough," the downtuned, acoustic psych-blues of "Battle of My Own" and the sleek New Wave–isms of "Invincible." "That day will see the release of a CD Fanpack, double vinyl gatefold and digital editions. A further standard CD album release will follow on November 27th."